Conversions are not going as planned.... I might just not know how to properly do it but the hair doesn't look the same at all when i try to shape it to different heads. This means I may have to start them from scratch to convert them. I just started my third job so time is a little bit ridiculously limited, but I will try. Sorry to bother you, but as I seem to be missing the hints ... which hair does the lopsided bun replace? Also the n, like the messy hair? In addition, I'd like to thank you for sharing these mods! 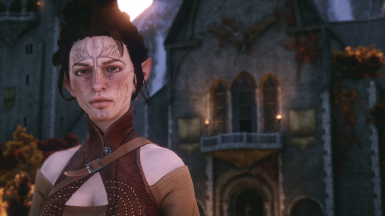 I'm using the messy hair right now on my inquisitor, and she looks badass. I'm really confused about the requirements page.. do you need it in order for these hairs to show? It's DAI Mod Manager - the tool suite just has both the Mod manager and the Mod Maker in one bundle for you. You just need DAI Mod Maker to create the merged patch as with all other non frosty based mods :) I apologize for any confusion! 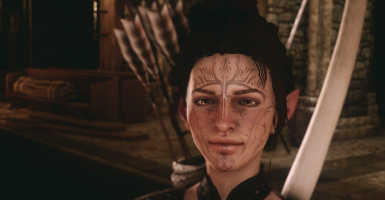 I installed the mod yesterday to use on my new mage. It worked perfectly fine, but when I got out of the cutscenes the hair was gone and showed the default hair. 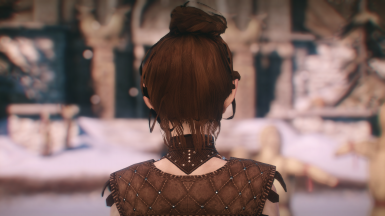 (And every time I enter a new cutscene the hair comes back) I came back here to check if I missed something but I don't think I did? Any help would be appreciated! Edit: I just needed to change the Mesh Quality in the settings to Ultra :P So now it works fine! 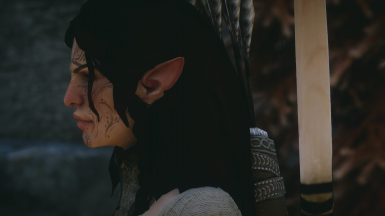 How did you get an earring on your Lavellan? what mod is it? Seconding the question about an EM conversion, especially dat messy bun. If not, no worries! I'm adding both these to my lady Lavellan hair options. OMG I LOVE YOU! I've been trying forever to successfully make behind the ears shoulder length messy hairstyle and ran into so many problems...I'm super excited to try this! 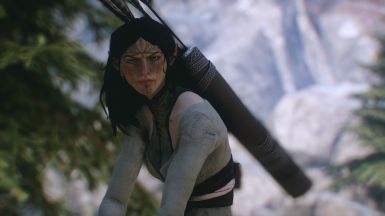 edit: Any chance of making a human female? I've had some success converting hairstyles for other races/genders (but not with all for some reason). It's just a matter of sizing it to the other race/gender's head and importing to the mod maker, as you would any other mod. I may try giving it a shot tonight/tomorrow and can let you know if I do. 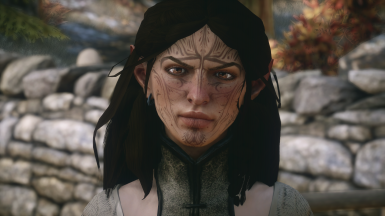 (I usually play elf females, but recently switches to human - not sure if it'll stick though).